"The Great Divergence" is the span from 1980 to the present in which the U.S. income distribution has gone haywire. A disproportionate fraction of gains have gone to those at the highest income levels, leaving the rest of us in their dust. 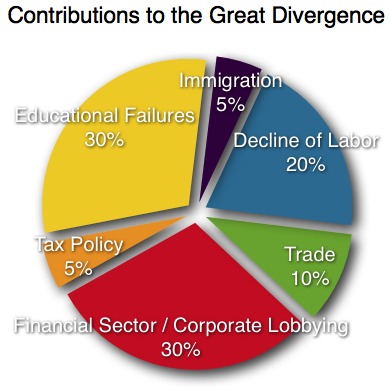 What factors contributed to The Great Divergence? Timothy Noah, senior editor of The New Republic, wrote a 10-part series in Slate last year in which he considered all the factors bandied about by economists. Noah concluded that some potential contributors actually had little or no impact on income divergence. For example, race and gender were eliminated on the grounds that the gaps between men and women and between whites and blacks have not increased. The gender gap actually decreased by 50%. Single-parenthood and the computer revolution were also considered and dismissed. Panderbear constructed the pie chart using rough percentages assigned by Noah to those factors that did have measurable effect. Immigration putting downward pressure on the wages of unskilled U.S. workers had a modest effect, as did trade with low-wage countries. Dramatic changes in tax policy beginning with President Reagan were judged to have a relatively small impact, because The Great Divergence appears in both pre-tax and after-tax incomes. The decline in labor union membership and consequent loss of political clout was deemed an important contributor to income divergence. Education related failures including decelerating rates of educational attainment and failure of schools to prepare students for the new economy are a major factor. A financial sector grown morbidly obese inventing ever more complex financial instruments of unknowable risk, yet generating huge profits, and the dramatic increase in CEO's salaries and in corporate lobbying of Congress were also major contributors to The Great Divergence. Which government actions or failures to act aided and abetted these contributors to our historically high income divergence? Coming up.